“I cannot thank you enough for providing this service,” says Amanda, who lives in a social housing unit after developing a physical disability. “I hope with all my heart that you continue to do this for the people who most need good quality food. WE MATTER! We are WORTHY of tasty, fresh food! “You give people nutritious food they could never afford to buy. People are struggling so much – they really need their health and stamina. You just don’t get it with low quality food. “You guys are shining a light in the dark world we live in. “When I first became unemployed because of my physical disability, I didn’t go into a supermarket for two years. “The FareShare meals are amazing – the best you will ever get. We can’t afford meat. I was elated with the FareShare meat. It was real meat. It blew me away. I’ve never received a meal with pork. It’s my favourite meat but I can hardly ever afford it. Like many people living on a low income, Amanda who has a medical background, puts her rent first leaving little or nothing to cover food. “All my pension goes on rent, it’s horrendous. How can you afford bills and keep a roof over your head? As a single person with little family support, Amanda’s physical disability placed her in a vulnerable position. 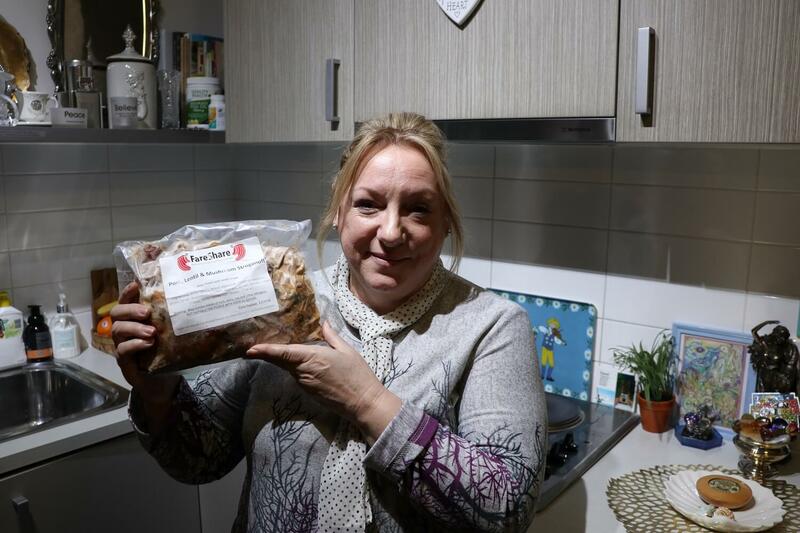 While grateful for food parcels from local charities, Amanda says there is nothing sustaining in them and she’s often left feeling demoralised. “You can’t live on tea, coffee, biscuits and cans of beans. No veggies and no fruit. I need a real meal! Knowing that so many people are struggling, Amanda finds Australia’s level of food waste hard to bear. Above all, Amanda believes good quality meals and nutrition should be available to everyone – particularly those who need it most. Amanda’s story was featured in our Christmas Appeal. With your support we aim to double our social impact in 2019 and cook 2.5 million meals to give people facing serious hardship a critical boost to their self esteem, wellbeing and energy.